Once again a release by Gentlemen Records from Rotterdam. This time by a man from Belfast in Northern Ireland. 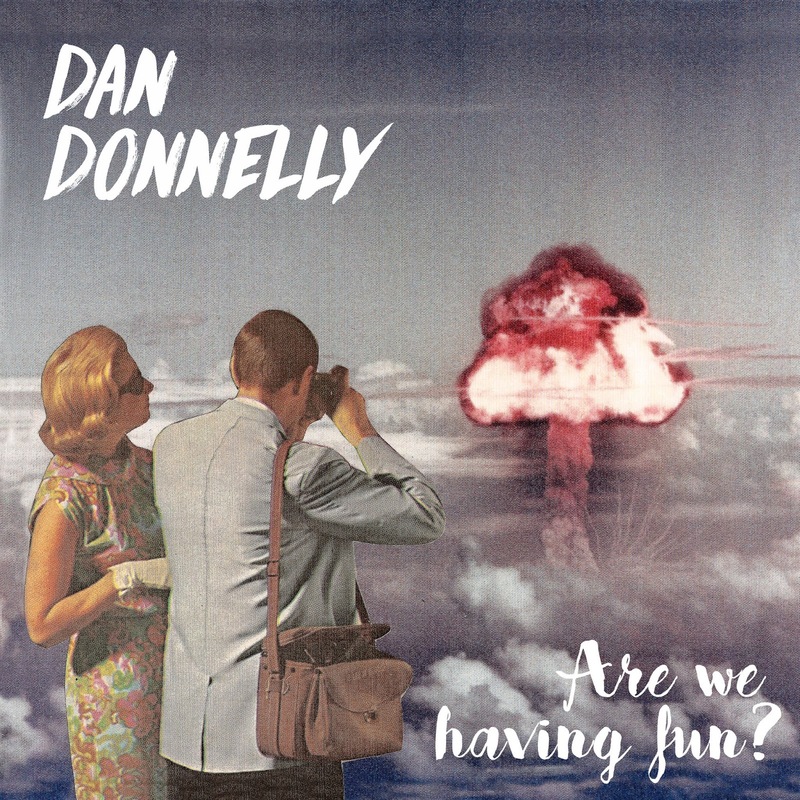 Dan Donnelly releases his fifth solo album, although this is his first one since 2011. In the years in between he has toured with The Wonder Stuff, so our own HareD must have seen him play over the years. The cover art reminds me of poster popular in the early 80s of Thatcher and Reagan in an amorous embrace while the bombs go off around them. The question asked on the cover can't be answered by looking at it. The woman seems slightly disgusted, the man totally fascinated looking through the lens of his camera to photograph the scene as good as possible. Undoubtedly all the filters and lighting settings are perfectly installed to make it a grand one. The title song 'Time Of Our Lives' holds the title to the album within it. The song is as ambiguous as the title of the album is. "So this is it" the first sentence already shows that not all is well. The singer is in an introspective mood, most likely not liking what he sees. "Is this the time of our lives?". The music reflects the mood. When listening superficially, I am convinced, this song comes over to the listener as one big party. Up tempo, a great guitar run, a violin accompanying an upbeat vocal. Then I listened more closely and noticed the bittersweet element that permeated the whole song. Nothing is really what it seems. Is this it?, is the question not put directly, yet certainly all over the song. Donnelly made this song really, really well. For now he concludes that yes, this is the time of our lives, but listening more closely it seems he can change his mind any time soon if he hasn't already. A great song to open the album with. This mood is continued throughout Are We Having Fun?. There is more to life than the problems a person faces on a day to day basis. Whether of a personal level or because of (political) developments: "I don't care", is one answer to those. Although the songs of Dan Donnelly can be labelled bittersweet, they all have the same quality. Somehow they seem to float forward effortlessly. A sign of laborious work of honing the songs right until that moment they reach perfection. Whether a song holds a Dylan or Young folk element or rock away in a modest form of ingrain some pop, they all have that quality of seeming, but deceptive effortlessness. There is another quality. Several songs hold moments that have me thinking, what is that song? but before I know it the moment is gone. Strangely enough I found myself into the album faster than being distracted as would be normal. It says a lot about the quality of the songs on offer. Nothing spectacular, nothing new, simply very, very well made with the love of music in one hand and the right skills in the other. With Are We Having Fun Yet? I am introduced to an artist that is recording since the 90s, with me in total oblivion. That has changed and I am the better for it. This is an album containing several small gems. Once I noticed them they never stopped glittering in front of my eyes. So, is that question answered? On my personal level? Oh, yeah!